1. Could you tell me more about your volunteering initiative and why you have joined? Basically I became Intrested in TED like in information platform not so long ago. I was watching some random speeches on YouTube . But before very important moment in my life my mom sent me the couple videos for help me out meet with it face to face and do not lose. 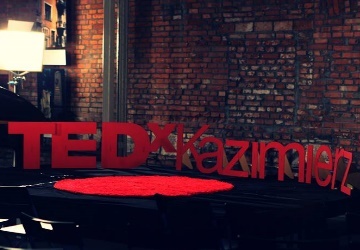 After that I found out that one of my friend volunteering in TEDxKaziemierz. And invited me to see how it works . Personally, for me it’s a good chance to see stuffing of TEDx events in real ,challenge myself and have ( I hope) a good experience. Plus! New people always inspire me for new goals, soooo why not? 2. Why do you volunteer and what you you know about TED and TEDx? Cos I have never be a volunteer in my life. Oh no, I was once ! Colored the city bridge in blue and yellow . Now I Want to reach the next level. In my opinion, TED and TED x is the big energy of global , stream of motivation and knowledge, experience and inspiration. 3. How do you contribute to the volunteering initiative? I guess I can make your body moved,peeps, and clap your hands bellow the head! What was the funniest, strangest or most interesting experience that you would like to share since you came to Cracow? It’s short story , but it surprised me a lot! Once upon a time I was living in NYC and decided to go for model super-puper casting (challenged myself again). It was a huuuuuuge line outside of building. All people who was passing by asked :” Wait, Wait, is the new IPhone already realized ? “ or “ Free Tattoo ?” Of course only experienced and famous models of big apple passed this casting. But story not about this . ￼5. What do you want to achieve for yourself but also for other people? Learn how to turned difficult live situations into the best adventures in my life!